Lymphomas are malignant hematopoietic neoplasms arising from mature lymphoid cells that typically reside within extramedullary lymphoid tissues, including the lymph nodes and spleen. However, lymphomas can frequently involve the extranodal tissues, including peripheral blood (leukemia) and/or the bone marrow. There are even rare instances in which the bone marrow is the sole location of involvement by lymphoma . A variety of infiltration patterns may be observed (paratrabecular, interstitial, or sinusoidal) in the various B and T cell lymphomas, besides varying background microenvironment inflammatory cells (e.g., in Hodgkin lymphoma, T cell lymphomas). Both pattern and microenvironment are useful features that assist in characterizing marrow involvement by providing clues to the nature of the lymphoma in cases where marrow involvement is the presenting feature. Ancillary studies such as flow cytometry and immunohistochemistry are both complementary studies in evaluating for marrow involvement. 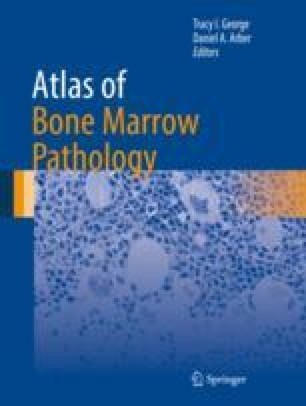 Zwarthoed C, El-Galaly TC, Canepari M, Ouvrier MJ, Viotti J, Ettaiche M, et al Prognostic value of bone marrow tracer uptake pattern in baseline PET scan in Hodgkin Lymphoma: results from an International Collaborative Study. J Nucl Med. 2017. pii: jnumed.116.184218. doi: https://doi.org/10.2967/jnumed.116.184218.